The cashew nut tree (Scientific name: Anacardium occidentale) is a tropical evergreen tree that produces the cashew seed and the cashew apple. The Cashew nut tree is grown for its delightful nutritious kernels, apple and the nut shell liquid. Cashew nut is one of the important nuts grown in the world; its originality is traced back in Brazil. The nuts are popular in confectionary works. You can use plant's Fruit for juice, liqueur, jam, or wine; the Resin is used for medicine; the nut shell oil for manufacturing varnish, inks, tiles, and brake linings. You can inter-crop the Cashew nuts with mangoes, bananas, coconuts, and citrus. Cashew nuts are a popular snack and food source. Cashews, unlike other oily tree nuts, contain starch to about 10% of their weight. This makes them more effective than other nuts in thickening water-based dishes such as soups, meat stews, and some Indian milk-based desserts. Many southeast Asian and south Asian cuisines use cashews for this unusual characteristic, rather than other nuts. The Cashew nut was introduced in Masindi, Kumi, soroti & drier districts of Uganda. Currently we do not have a specific progeny of the cashew tree, and the ones grown are not documented in the national crop resource. Cashew can be cultivated in soils ranging from coastal sandy to deep sandy loam soils in plain lands. The ultimate need in growing is the moderate fertility and well drainage of the ground at a pH range of 5.8 to 6.8. Cashew trees can be started using both the seeds or vegetatively using the stem cuttings. The nuts can germinate within 4 days when lying on wet soils. Clear off thorny bushes, shrubs and other weeds in preparation of the field meant for planting, do this before the onset of the rains. For commercial establishment of an orchard, use square, rectangular or triangular systems for arrangement of the cashew trees in the plantatation. Open up circular pits of 60 cm in diameter and 60 cm in depth. Leave the pits open for about 15-20 days to enable them cure. After pre-curing fill pits completely with top soil mixed thoroughly with a basin of compost, where possible add in 300-400g of rock phosphate and an anti termite pesticide. To plant, scoop out a spade full of top soil from the centre of the pit. Then use healthy 10-12 months old soft wood grafts to plant. Alternatively, fresh seeds that sink in water can be planted in an upright position in a planting bag containing a loose, sterilized soil mixture. Plant 3 to 4 seeds directly in the planting hole. Support the graft with appropriate stake to protect it from wind and animals. Gently water the seedlings and also mulch to preserve the moisture in the ground. During the early years of growth of a cashew tree plantation inter crop with vegetables like chilies, cucurbits to enhance your production gains. Also have a spray routine against pests and diseases like the cashew stem and root borer, leaf miners, apple and nut borer, and mealy bugs. Do not forget to prune during the first two years to encourage lateral branching and growth. The seasonal yield of a mature tree under good management is between 60kg to 80 kg. 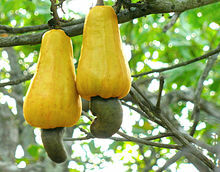 Cashew apples can be harvested when the fruits have turned from green to yellow or even red. To harvest, clip the apple fruit with the nuts from the tree then gently separate the nuts from the apples. The cashew nut, often simply called a cashew, is widely consumed. Cashew nuts are a high value confectionary nut, and the most nuts found in the market are imported from Kenya South Africa or Tanzania as there no serious cashew nut processors or growers here in Uganda. The retail price for cashew nuts could go up to UGX8000/ per kilo. Cashew is eaten on its own, used in recipes, or processed into cashew cheese or cashew butter. Clear up land meant for planting. Open up circular pits of 60cm like 20 days before planting to expose the inner soil zones. Mix the top soils with compost and use it as a base in the hole. Scoop a hole from the soil base to create a planting center. Then place the graft root ball in the hole. Cover with soil and gently firm. Stake the seedling to protect it from winds or even animal damage. At an appropriate maturity pick the kennels to remove the nuts.